As I write at the end of February we are in the grip of the longest freezing period of weather for several winters. 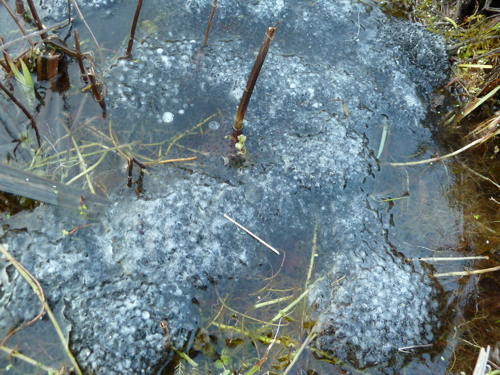 It looks lovely out there, but so cold the pond surfaces are frozen solid – as you can see from this frozen frogspawn which was laid in the few days before freeze started, and quickly got covered in frost, and now the pond surface has been frozen solid for several days, and covered with snow for the past three days. As it is too cold at the moment to get out there and finish pruning the roses and tidying the beds, I am turning to the thought of seed sowing, and greenhouses. 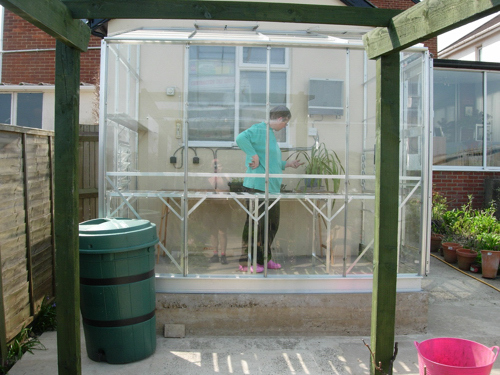 If you have read earlier entries of this blog you may recall one of the first things we did when we moved here was put up a polytunnel, so you may be wondering why I also wanted a greenhouse. The polytunnel is over 61 meters down the garden and does not have means to make it frost free. 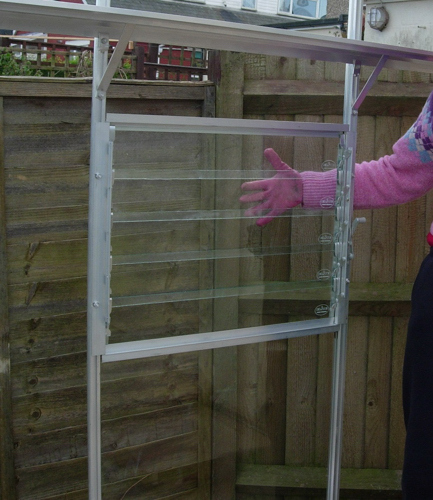 We needed somewhere I could raise plants from seed, and keep them at specific temperatures whilst they were growing to planting out stage, and where we could overwinter more tender plants in a frost-free environment. 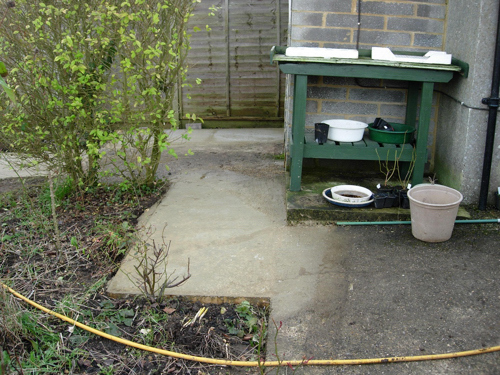 Below you can see the potting bench we brought from our previous tiny garden in London, with some of my potting equipment on the shelf – an old washing up bowl for mixing compost in, and a sieve for sieving compost and vermiculite. It is standing on the flat platform built for the oil tank that fed the Aga in the kitchen. 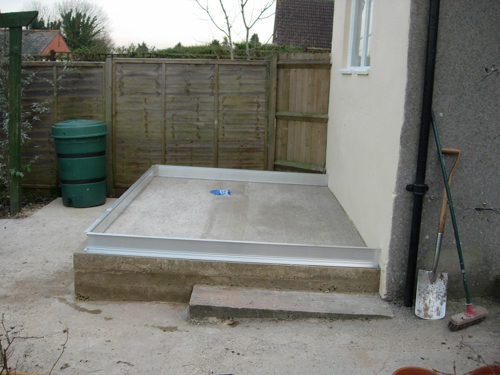 This illustrates one of the problems of where to put our greenhouse – how much we would have to build up the ground to make it flat. The other is that of getting electricity to it. The grey wall you can see on the right is the back of the garage, which has electricity to it already, so the obvious thing would be to extend this circuit to the greenhouse. So the site was decided! In our tiny garden in London we had a tiny lean-to glass greenhouse. It was 2m long by 60cm wide, had a sliding door, sitting on three paving slabs against our garage wall, and took a growbag for three tomatoes in it, and some homemade shelving at the far end for cuttings and overwintering geraniums. So I was quite comfortable with the idea that a lean-to greenhouse would involve less levelling of the ground (and take up less of the width of the garden up by the house). 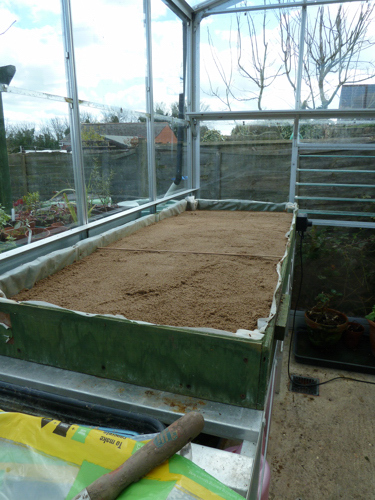 There was simply no option to have beds with soil in them in the greenhouse, making the site level would take a concrete base, and that was that! You can see how much further the flat base had to be extended, and how high the wooden shuttering is on the left hand side. This was for a greenhouse 2m wide, by 2.4m long. The step at the front was the original pad. You may note the waterbutt at the back which the guttering of the greenhouse was to hook up with, and the first post of the pergola beside that. As you can tell from the base plate we went for an aluminium greenhouse, and after extensive reading as well as our experience with our first greenhouse we went for both automatic opening vents in the ceiling (two of them), AND louvre panels in both the front and back walls to try and ensure maximum ventilation. The picture above is the back louvre section being put in – you may be able to see the aluminium shelf above it. I wish this was wider, most long trays are just too wide for it, and it is awkward to keep things adequately watered up there. As you can see we went for single level staging, also lightweight aluminium with removable slats so long trays can be inserted underneath as required. 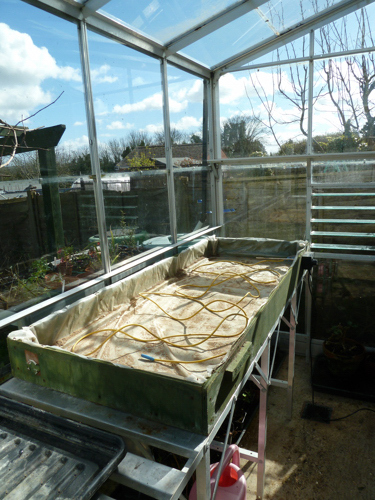 In terms of electrics we had two external socket points for propagators to be attached to, and a heater which is thermostatically controlled so it comes on if the temperature drops below a certain point. Turning to seed sowing:- If you look on the back of packets of seeds for instructions on growing many say sow under glass or with protection from February, so I did. Now that I take part in the HPS seed distribution I am tempted to start sowing as soon as my seed choices arrive at the end of January, and have to contain my enthusiasm as the conditions are rarely right for them to be sown immediately (even with stratification if required, I find it is best left til the second half of February to put them in the fridge for a couple of weeks). I asked for a plug in propagator for Christmas that first year – I had one the size of a shoe box already, and was given one double that size. I still have seeds sorted into boxes marked by the month they should be sown according to the packet starting with February but I have gradually started the main seed sowing later and later. 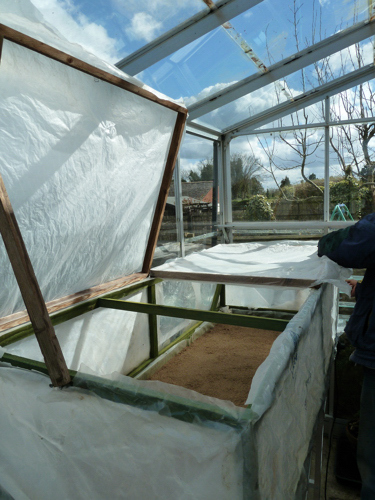 What is the point of trying to hurry hardy annuals or perennials that can be sown outside in April by sowing under cover when you always need your precious greenhouse space for more exotic things? I have discovered even leeks sulk if you sow them too early and won’t germinate if it is too cold and wet. Again there is no point sowing bedding plants for hanging baskets and pots too early as the baskets cannot go out until almost June here, nor can courgettes, which germinate and become big plants within a fortnight, so shouldn’t be sown until almost the beginning of May. 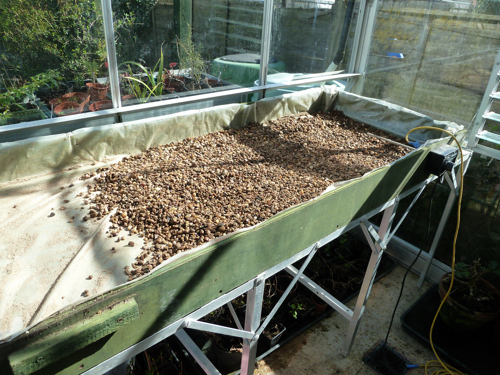 Seeds germinated in the heated propagators in February and then potted on required the greenhouse to be heated to 15 degrees to keep them alive, from late Feb or early March until quite late in April. They also grew etiolated as they could not be hardened off or planted out until the weather improved. 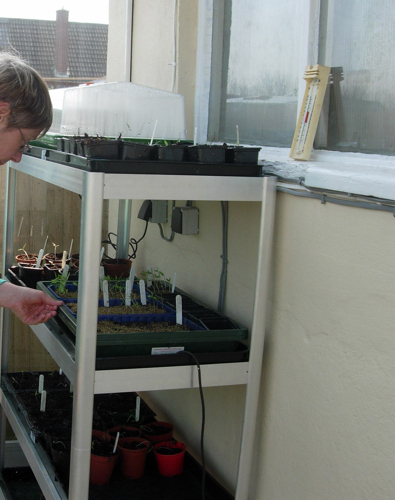 One on the top shelf with the lid still on, and I am inspecting the seedlings in the second heated propagator on the next shelf down, but both were still too little for the volume of seeds I was sowing. After research on the internet we built a heated hotbed of our own. (That is to say, I had the idea after reading some information and did some exploratory research; my husband did lots of technical research; we discussed our requirements and drew up a plan; my husband built it.) 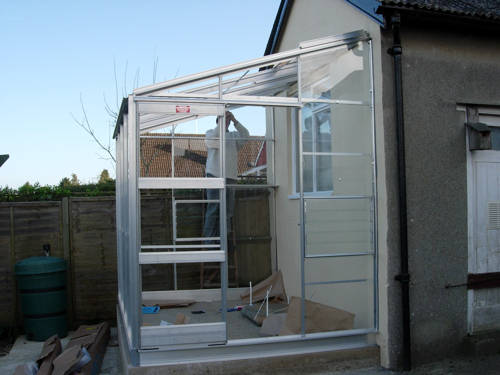 It is as big as we can accommodate in the greenhouse, and has to be able to be removed by two people and stored for the 9-10 months of the year it is not in use. 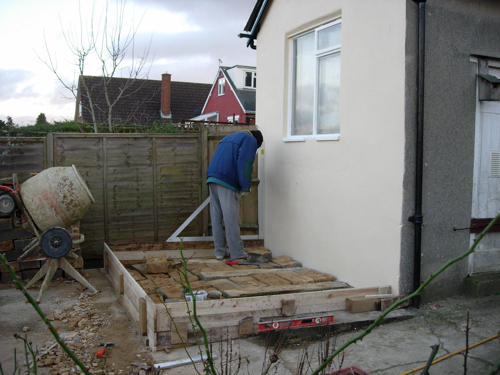 Below are the pictures showing the construction of the hotbed which is about 2m long. A 15cm deep box is created and lined with heavy duty plastic. The heat is provided by a heated cable, and a thermostatic unit. You put 5cm of pea gravel in the bottom of the bed, and then 2.5 cm of sharp sand. The sensor probe of the thermostat should now be resting on the sand. 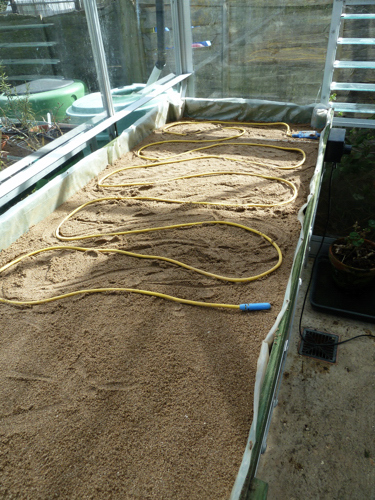 Then place the heated cable on the sand and cover with a further 2.5 cm of sand. Make sure your sand stays damp or the heat won’t be conducted as effectively. 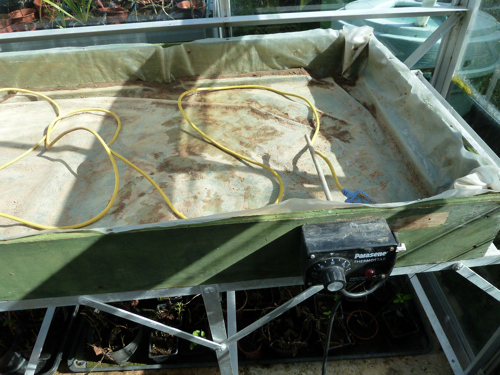 The last picture shows the lid on the propagator – a frame covered with heavy duty plastic. The first version was a lift on lift off version with no top opening. This I could not get on and off by myself, so was adapted to have a top surface that could be raised and propped up – but it was too unwieldy to lift and prop in one go, so has become this version you see, I can open each half and prop it up separately for access and ventilation. I have a step stool so I can reach the pots and undertake watering/weeding etc without having to take the lid off at all, causing less disturbance to the seedlings. It is very helpful that at different times the hotbed can be set a different temperatures. Initially when I was sowing in February as the seed packets said I could set it at 15 degrees to germinate winter veg and lettuce for example, and then keep them at that temperature when they grew on. 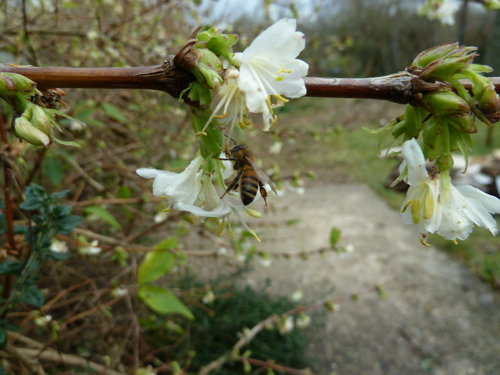 Then a few weeks later up the temperature to 18 degrees or even 20-24 for some seeds. After several years of usage I have determined that it is helpful to have an unheated area at the far end for things that either don’t need bottom heat to germinate, or once germinated and growing on. That way the hotbed keeps seedlings at the right temperature, and sometimes even a few of the potted on plants until late March, and the greenhouse only needs to be heated to 15 degrees at the end of March and in April. Nowadays the hotbed never comes out and gets commissioned until March. When all the plants are moved to their summer positions the hotbed gets dismantled again, the aggregates are bagged up for use in building projects round the garden at a later date, and the base and lid and electrics are removed to their own storage unit until next year. Next time, making a cowslip meadow. 1 Comments To "On a Chalk Hillside March 2018"